Climate science is sophistry…i.e., BS. We must now look at Roy Spencer’s simple model of the greenhouse effect to see what he’s actually doing with it and what he actually thinks about it. I have updated his current model but also have a copy from some time he did this before using a sphere with concentric shell as an example – they’re both updated with “reality” sheets and “Spencer” sheets. And therefore, we now clearly see, that the atmospheric flux is being directly added in as heat. 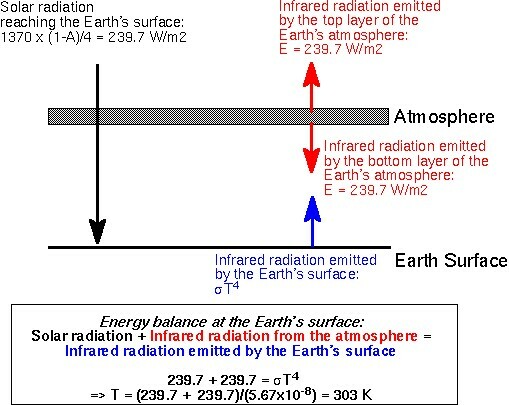 It is precisely the same as the consensus radiative greenhouse effect diagrams such as this one. Note what happens inside the brackets. He takes the difference between the solar input and the surface output because, as is correct, the heat input from the Sun on the surface is the difference between the temperature of the solar radiation and the temperature of the surface, i.e., the difference between the solar input flux and the surface output flux. And so there you have it: the atmospheric flux is being added back in as input energy, as heat (or as whatever else you want to call it). And that most certainly is in violation of the Laws of Thermodynamics and hence all of physics. The approach isn’t even self-consistent. If the heat input from the sun is given by the difference in flux between the solar input and surface output, FSun – FSurf(i), then why wouldn’t the heat input from the atmosphere be given by the difference between the atmospheric flux and surface flux, as in FAtmo(i) – FSurf(i)? Why is the atmospheric flux being added back in directly irrespective of the temperature of the surface? You see how the logic automatically begins to break down when you start violating the laws of existence. If you modify the Excel sheet to match that, then the final surface temperature is -47°C! Why so cold? Because none of it makes sense. Because the entire concept is not based in reality. It’s not logically self-consistent, and it can’t be self consistent because it isn’t logically consistent with existence in the first place with the entry postulate that backradiation can cause further temperature increase than what the source initially provided. That’s Ontological Mathematics philosophy right there for you. Gallery | This entry was posted in Fraud of the Greenhouse Effect and tagged Roy Spencer. Bookmark the permalink. Joe, you linked a nice set of heat equations, in a discussion with some fellow debating you, some time ago. Those various derivations of heat equations have no reference to the temperature of the emitter or absorber, but only the flux being emitted or absorbed. And they look just like the flux terms Roy used above. Why do you insist that the flux from the atmosphere not be included? Is that flux not made up of photons with momentum? Then they contain energy. HEAT is the result, positive or negative, of the total of all flux emitted offset by all flux absorbed. No heat equation contains only one term. Because read the article. The photons from the atmosphere are not heat. If you try to treat them as heat, you get a nonsensical result…and equation. The correct heat equation doesn’t contain only one term. The heat equation includes the difference of two terms – the input flux and the output flux. The atmospheric flux is not an input – it can not transfer additional heat to the surface because it is lower in temperature, or at most equal in temperature, to the surface. In his spreadsheet, Spencer also violates the laws of quantum physics. He does the infamous “divide-by-4” calculation, which confuses energy with photon flux. [Joseph has covered this several times before, but for anyone new here, Earth’s “disk” receives about 1365 Watts/m^2. After albedo, that leaves about 960 Watts/m^2. Considering the 960 as energy, and Earth’s surface is a sphere (4 times the area of a “disk”) then dividing 960 by 4 yields 240 Watts/m^2. And, the “240” figure is what Spencer uses in his spreadsheet for “absorbed solar”. So, Spencer violates the laws of thermo, AND the laws of quantum physics. He gets it all WRONG. Pseudoscience at its best! That’s pretty good Geran thanks. I’d never put it in those terms. Good one. Probably should fix it on PSI as well. Joe has already pointed out the duplicitous nature of Spencer who always says his “version” of how things work does not transfer heat from cold to hot and then he just goes and does it anyway ! Geran has succinctly pointed out the fraud inherent in using an “average” input solar flux – this has long been a source of criticism of the models used by “greenhouse effect” acolytes. I noted on Spencer’s site a whole host of smug acolytes pouring scorn on any who could dare to question the “prophet”. By this action they reveal that this is the teachings of a “religion” – not science. I’ll mention another problem with Spencer’s “Physics” AND “Maths”. This one is such a basic FAIL that it beggars belief. Force and bending moment are used extensively in engineering. Force has units of newtons and bending moment has units of newton metres BUT there isn’t an engineer on Earth that would add these in an “equation” despite their obvious relationship to each other. 1. That it purports to add temperatures expressed in Kelvin. 2. That the term inside the brackets evaluates to units of W/m2. 3. That the term inside the brackets is multiplied by a time constant over “heat capacity”. Spencer lists the units of his heat capacity – $C$3 in his spreadsheet as J per degree per cubic metre. So it is simple to check dimensions of units that Spencer has quoted. Doing so reveals Spencer sees no problems in adding Kelvin – B11 in the spreadsheet – to the term in the brackets – W/m2 – times sec*K*m3/J. This evaluates to Kelvin (B11) + metreKelvin (W/m2 * seconds * K * m3/W.seconds) – a hitherto unknown unit. Even using the standard definition of heat capacity of J/K the result of the dimensional analysis is still wrong. evaluates to W/m2 (the term in brackets) * Kelvin/W = W/m2 * Kelvin/ W = Kelvin/m2 ?? I am sorry to point out the obvious but you CANNOT just write “equations” that are not dimensionally consistent and have any credibility. I know all of the acolytes, maybe even critics, will excuse this and deny it is even a problem BUT it FAILS the fundamental principle of Physics as quoted from Young and Freedman – consistency in units in equations. You cannot even call ANY of the expressions Spencer uses in his spreadsheet “equations” because they are NOT ! No it’s because I added a row at the top on Spencer’s sheet. Please explain how this violates the zeroth law of thermodynamics. Please explain how this violates the first law of thermodynamics (which can be expressed without any reference to heat). I think it is saying exactly what the first law says: The change in internal energy (here taking the form of a temperature increase, dTsurf * Cp) is equal to the total of energy added (including work done on the system), minus the total energy leaving (including work done by the system). In this case, I think there’s an implicit stipulation is that no work is done in either direction. Please explain how this violates the second law of thermodynamics. If you are successful in finding a violation of the second law, then please explain how to reformulate the first law so that an equation consistent with the first law does not violate the second law. Otherwise, you will have discovered a counterexample to the first law. Please explain what this has to do, even remotely, with the third law of thermodynamics. Spencer’s equation states that no three systems can ever be in thermal equilibrium, since the coolest of the 3 systems will cause the warmer ones to rise in temperature. If they all start off at equal temperature, then they will heat each other and raise in temperature which violates the definition of heat and the definition of thermal equilibrium. Spencer’s equation thus violates the zeroth law. Spencer’s equation states that energy from a cold object will pass to a warmer object and raise its temperature which means that such energy is heat, which violates the definition of heat. Spencer’s equation thus violates the 1st law. The violations here for 2 & 3 aren’t as clear, and so my quoted statement is in the general sense that if you violate one subsection of physics, you violate all of physics. Thus I will edit the statement from “all of them” to “and all of physics”. Thanks for helping make that clear! In row 461 of your spreadsheet, the model is supposed to be at equilibrium, but the net energy flux into the surface (column I) is 96 W/m^2. Yet the surface temperature is unchanging, and no work is being done. Where is that 96 W/m^2 going? Is there a miscalculation? ScottM: There is an error in Spencer’s calculation, unrelated to what you ask above, which was missed and is now corrected on the “Reality” tab. Note that the flux emitted by the atmosphere is always less than the flux emitted by the surface, and therefore the atmosphere can not transfer heat to the surface. The question was, where does the 96 W/m^2 go? It goes to outside the Earth, to space. Just found your response, Joe. I don’t follow the comments on your posts, but was just clicking back a few to see. “Flux” from the atmosphere is not “heat”, but it is “energy” — as you correctly stipulate when quoting from a thermodynamics text a few posts later. Energy flux to the surface must be accounted for, no matter what the source. This is why the heat equations you yourself have cited include terms for ALL emitters, not just “hotter” ones. By all means attack the false calculations of the warmists, who derive their sensitivity to CO2 from insufficiently robust models, where much of the climate’s behavior is ignored, and then use adjusted forcing factors for CO2 and unobserved H2O feedbacks to arrive a current “fits”, and then gaze into their badly-molded crystal ball to see catastrophe. But don’t attack the raw radiative physics of omni-directional energy flux, because you can’t tell a photon from a “colder” emitter not to be absorbed by a “warmer” target. That photon doesn’t represent “heat” — no photon does — but it does represent energy. Add and deduct all those photons up, each according to its energy level, and then you can see “heat”, in one direction or another, as the sign reveals for each emitter in the system. Radiation from a cool source cannot act as heat for a warmer object, and therefore, radiation from a cool source does not cause a warmer source to become warmer. Energy is not always heat, and therefore energy doesn’t always act to increase temperature. Only when energy can be heat, when it is going from warm to cool, can it serve to increase temperature for the cool. Laurence Kennedy on How Long is Twilight?